Be inspired by the determination of this 32 year-old widow and single mom (with four children) who struggled to finish college, while serving as bread winner to her family at the same time. Filipinos value the importance of quality education now more than ever, as the real world demands for quality workforce. The mere possession of a diploma is not enough; employers now ask from a potential applicant skills, work experience, and good grades. And this is emphasized whenever graduation time comes up. All this bears resonance with Mae Vargas of Teresa, Rizal, 32, and a single mother. “My family couldn’t afford to send me to college so I ended up only with a high school diploma,” she shared. Add to that the fact that her family already depended on her, so she started taking different jobs. “I was a department store sales clerk, a fast food diner cashier, even a private baby sitter.” Even if she worked diligently, the salary she earned was not enough to support her needs and those of her family. When she married young, life proved to be more difficult, as her husband was not earning well. He was also sickly and died soon, leaving Mae to be a widow at 28, with four children to take care of. Help came in the form of a relative offering to shoulder her tuition fees, with the condition that she finish and get a diploma. She recalls that before that, she would usually pass by Sumulong Highway on her way home and see schools along the road offering HRM or Tourism. When she got the golden ticket to finally go to college, Mae decided to go to the Asian School for the Hospitality Arts (ASHA), a school that takes pride with its progressive hospitality and vocational education. 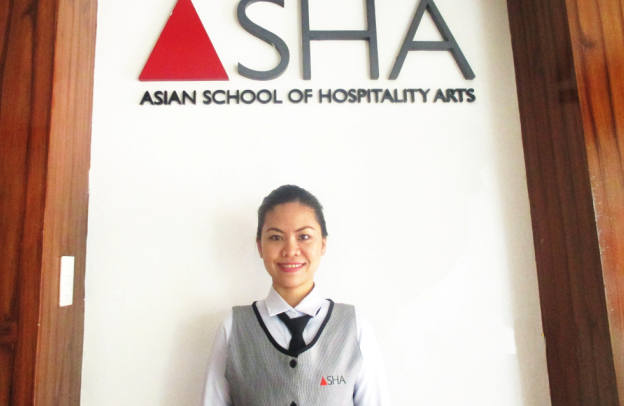 “I chose ASHA because the school is accommodating and concerned with the students and their welfare. I also learned from the other students that the teachers are well-known experts in the industry,” she explained. Instead of taking short courses, she decided to take a four-year course, the BS in Hotel and Restaurant Management (HRM) program. With the help of ASHA’s multi-disciplinary teaching approach, she was able to strike a balance between studying, working, and taking care of her family with ease. “I learned a lot from the class lectures and the hands-on training. The industry practitioners talked about the best practices in the hotel and different departments. I was encouraged not only by the classes and training but also by the first-hand testimonies of previous graduates,” Mae elaborated. Mae while undergoing a practical evaluation from one of her professors. She had her internship at the five-star Shangri-La Makati Hotel. “I did 800 hours of on-the-job training while studying and taking care of my family,” Mae said with pride. All this paid off well, as Mae has marched, along with other graduates, as she received her college diploma, and graduated with high honors. Shangri-La Makati Hotel is even considering her for a job in the food and beverage department because of her good performance during her OJT. ASHA has campuses located in Antipolo, Kamias (QC), Tagaytay, and Santolan (San Juan). For more information, call 907-8642/ 0917-8787191.